ear Friends, I’m sure you are also following with horror the rightwards drift and anti-EU sentiment brewing across Europe. The Dutch referendum should be the final wake-up call, alerting people to the real risk of the UK’s EU referendum resulting in a victory for Leave. 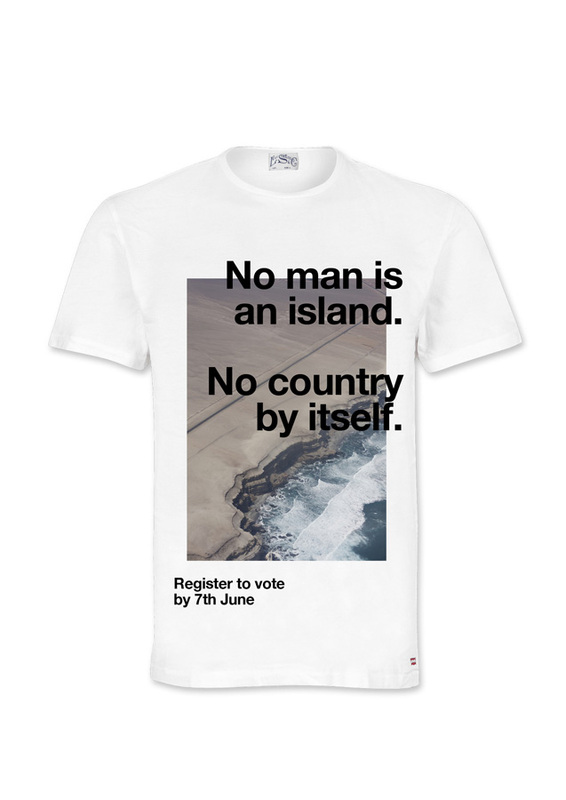 The official ‘Remain’ campaign feels lame and is lacking in passion. It also lacks an active drive to get voters registered – and with the deadline already falling two weeks before the referendum, this should be an urgent priority”. With this statement on the 25th of April, renowned artist Wolfgang Tillmans became a crusader with typographic means against #Brexit. “I want to get involved and actively campaign. In particular, I want to work towards maximizing turnout among younger voters by focusing on the first, crucial step: voter registration – the deadline for which is June 7! So anyone who hasn’t registered before this date has no chance of having a say, no matter how strongly they feel about the issue. So the really crucial date is June 7. Everyone’s grannies registered their vote long ago, but students no longer get automatically registered by their unis. This is because of a new law brought in by the Conservatives that makes it possible for them to disenfranchise up to 800,000 students, who as a group tend to move around a lot more and so drop off the voter register easily. I feel that we have reached a critical moment that could prove to be a turning point for Europe as we know and enjoy it – one that might result in a cascade of problematic consequences and political fall-out. Firstly, the weakening of the EU is a goal being actively pursued by strongmen like Vladimir Putin and European parties on the far-right. Brexit could effectively spell the end of the EU. It’s a flawed and problematic institution, but on the whole it stands for a democratic worldview, human rights and favours cooperation over confrontation. Let’s hope for the best - but hope may not be enough. Following up his campaign Tillmans released another statement, an essay for every creative to read and devour. The reasons why I felt compelled to get involved in the UK-EU referendum are personal – my lifelong involvement with the UK, my love for the UK and its culture, music and people, my career’s groundedness in Britain and the always warm welcome I felt here as a German. I see myself as a product of the European post-war history of reconciliation, peace and exchange. However, the more pressing reason why I morphed in recent months from an inherently political, to an overtly political person, lies in my observation of the larger geopolitical situation and an understanding of Western cultures, as sleepwalkers into the abyss. The term “Sleepwalkers” comes from the title of the book by Christopher Clark which describes Europe in 1914, when different societies ended up in a world war, which none of them wanted. Today, I see the Western world sleepwalking towards the demolition of the very institutions of democracy, negotiation and moderation which allow us to live the lives that we are living. In the US we are currently observing a rage which is threatening to wash away great American values, which anchor the world as we know it. These people claim to make America great again, but they embody the opposite. In the East of Europe, we see a surge in nationalist fervour, which wants to sweep away freedoms won only some 25 years ago. In western Europe and Britain, we see a wave of discontent with the outcome of globalisation, which turns its anger from the real perpetrators, say for example the tax-evading billionaires, to the weakest in our societies: refugees from terror and war. The EU is a scapegoat in the midst of all this. For decades press and politicians have loaded blame on it, when in fact it does its best to deal with the fallout of the tectonic shifts in world politics. The EU takes upon itself the task to negotiate the affairs of 28 member states. This can never be an easy task. I admire that this even works so well. We can exchange goods without having to probe product safety each and every time between the 28 countries. Brussels bureaucracy deals with that, and actually quite efficiently. People can move and work in whichever EU country they like. In fact, 1.5 million Brits enjoy this right just now, and due to deregulation of air travel millions enjoy cheap air travel to Europe. We have in the last decades become a European family, with much less dividing us than connecting us. EU laws, making up only 10 per cent of laws made in the UK, enshrined rights like four weeks’ paid holiday, health and safety and much more. The EU enforces standards that protect the environment. Water pollution doesn’t respect borders, and here especially Brits benefit from rules that span across the continent. There are frustrations with the very nature of compromise and shared decision making. The EU is well aware of its shortcomings and David Cameron has secured a clause for the UK to not part-take in a move towards a European States. This is no longer on the cards. There is no longer a danger of giving up British sovereignty. I feel that the forces driving towards the UK leaving the EU are disregarding a most crucial point – the values the EU stands for are fragile in this world of extremism. The anti-democratic forces in eastern Europe, the Islamist forces around the Mediterranean, the big business interests in North America, are all poised to wash away the EU’s laws of moderation. The use of Helvetica and Minion shows that the German photographer’s set of posters to encourage UK residents to vote to stay in the European Union, are to convey a clear, concise message. One can argue that this selection of fonts, this very dominant use of Helvetica is a statement on its own. “To say Helvetica is “ubiquitous” is almost like saying cars are everywhere these days. The better observation is that it is ubiquitous because it fulfills so many demands for modern type. So what is it that sets Helvetica apart?” writes Simon Garfield in Just My Type. And then he explains how this “clean, useful alphabet became as ubiquitous as the air we breathe”.